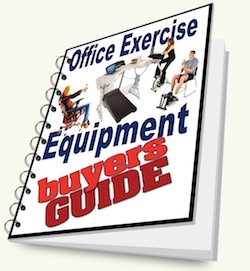 In coming up with innovative ways to fit exercise in at work there have been several advancements in office exercise equipment including styles of a desk exercise bike. These have been around for a few years but the underdesk bike has finally gotten the bosses approval and they are gaining in popularity. One of the first manufactured desk exercise bikes was the Geek-a-CycleTM that doesn’t appear to be in production anymore. The way this recumbent bike with desk worked was you had to keep peddling to keep your computer powered up! Under the desk pedal products are available in several models and a few different manufactures. 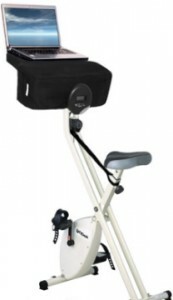 The first model to look at the a under desk pedal exerciser. Light weight, very portable and easy to use. 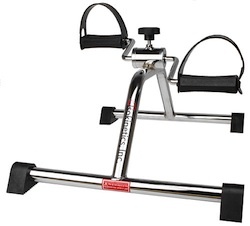 You can also use the pedal exerciser to exercise your arms. 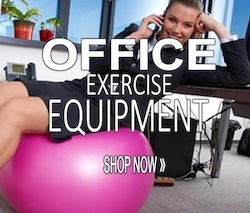 Perfect for exercise equipment for the office because you can park it and pedal under your desk while you are still working. Great idea to get fit on the bosses dime! 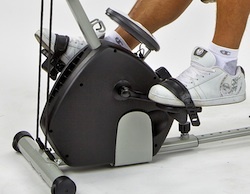 This next under desk cycle is actually part of an entire exercise system you can put together in your workplace. The Smooth Rider is suitable for heavy duty use and operates using magnetic resistance that is adjustable. The Smooth Rider is quiet and includes a digital display that clocks your speed, time and calculates calories burned. The final desk bicycle is an all in one desk and bicycle. Called the FitDesk. It is light, and folds for portability. This bicycle desk is a great way to keep on the move while still working at your computer. All in one unit of desk and bicycle you will have it all. Being productive and healthy is the perfect combination and it has been proven that body exercise improves brain activity and memory. Busy being kept after work hours to finish up a deadline? Don’t worry about missing the gym when you have a bicycle under your desk.